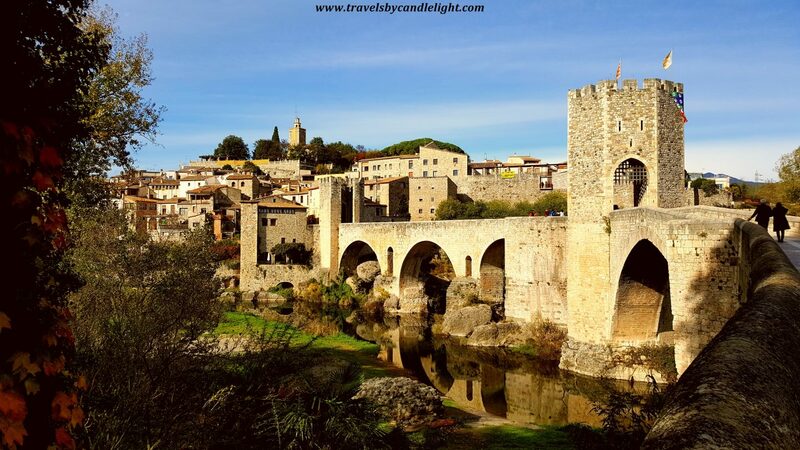 Have you ever heard of Besalú? Me neither. At least not before last November when I went to Spain for a one week holiday and, as I’ve been to Barcelona a couple of times in the past, this time I decided to go out and discover some of the Catalan gems. 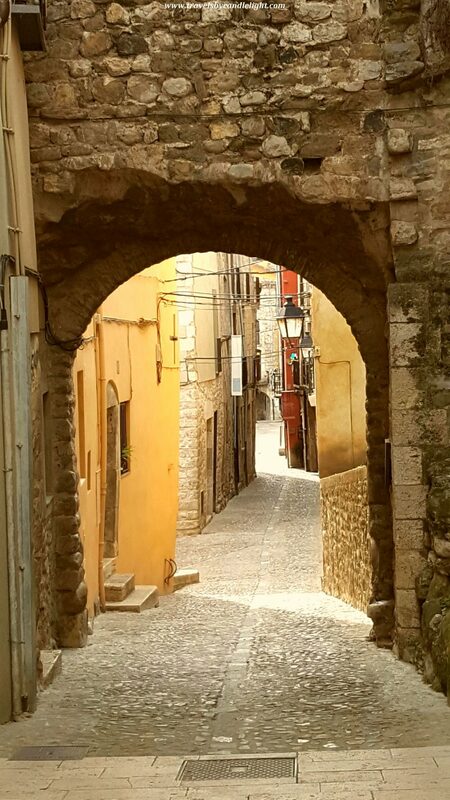 Said and done – one day, I found myself installed in a Teisa bus, cutting the way through a quite sun-browned Spanish countryside, heading to the small town of Besalú, credited to be one of the most beautiful Medieval towns in Spain. Located in the heart of Catalunya (Garrotxa region), at the foothills of the Pyrenees, the name of the town comes from the Latin “Bisuldunum”, meaning “a fort on a mountain between two rivers” – doesn’t it sound incredibly romantic?… It used to be an important town in Roman times; then it had Visigoth and Moorish rulers, to become one of the first independent counties in the area in the 9th century. 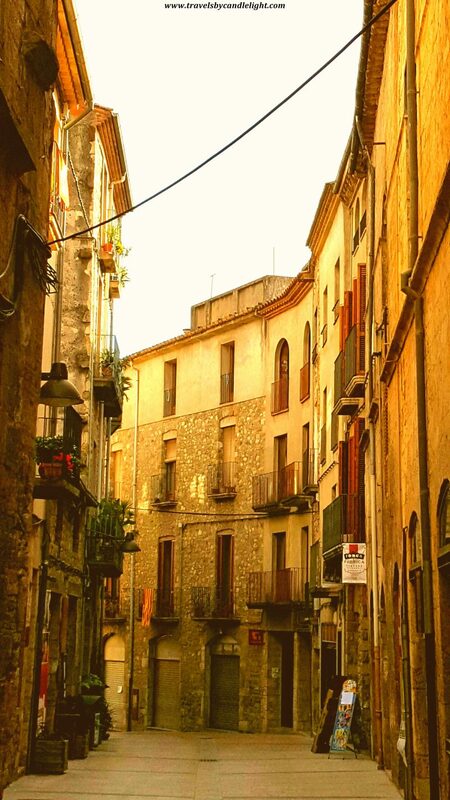 Starting 1111 it came under Barcelona’s control and from 1966, Besalú was declared a site of historical and artistic importance. The place is linked to some medieval characters, such as Wilfred the Hairy, who was the count of Besalú (among other titles) in the 9th century and many consider him one of the founders of a unified Catalonia or the medieval troubadour Raimon Vidal, notable for writing the first tract in a Romance language (Occitan), talking of grammar and poetry. I made a triumphal entrance into the town crossing the impressive 12th century Romanesque bridge over the river Fluvia. You want a postcard? 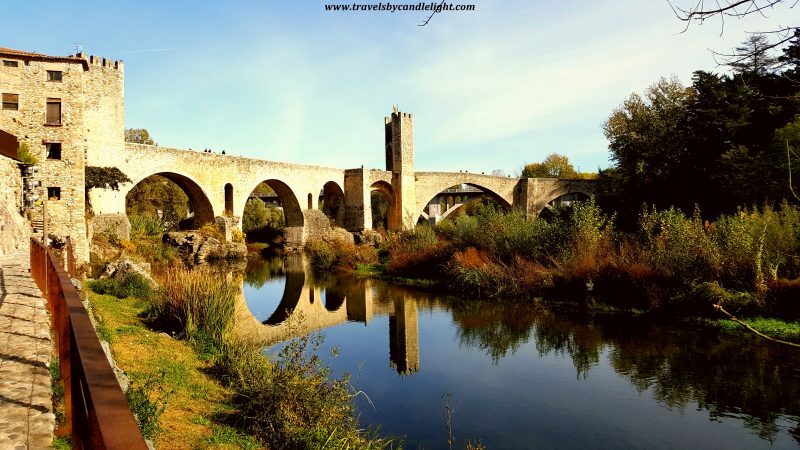 No need to buy one, just take a pic of Besalú bridge – with 7 uneven arcs and two towers, it is, without a doubt, the emblem of the town. Although it was heavily damaged during the Spanish Civil War, it has been well restored and now looks very well preserved. I have walked around and seen the bridge from all the angles, but I have a small tip for you – the most stunning views of the Bridge will be from the street called Portalet. The town is circled by the ancient wall from the c. XII-XIV, however only parts of the original one still exists today. 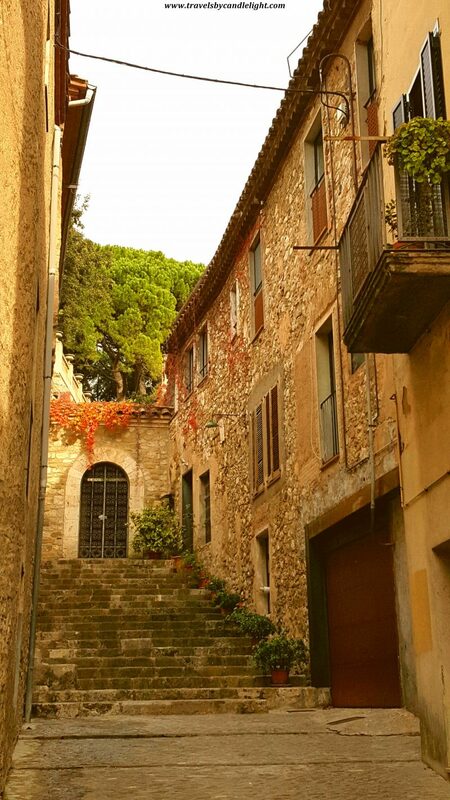 Once behind the wall, you will find yourself in a storybook: narrow cobblestone streets, ancient stone buildings and Romanesque churches. 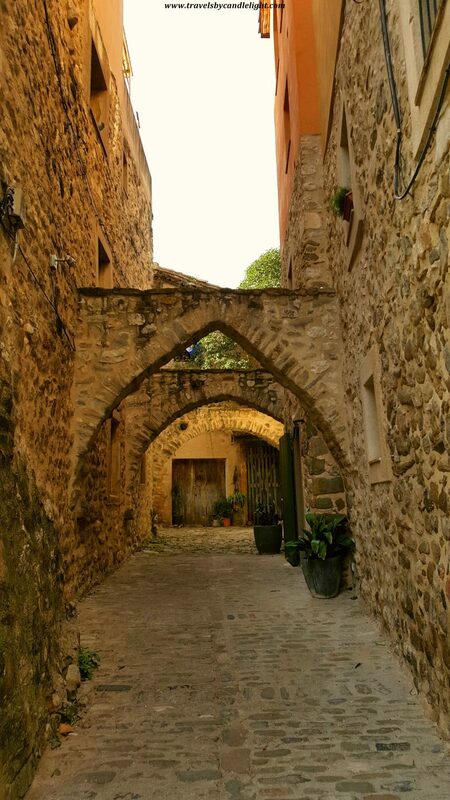 Some people would say it should be take you a couple of hours to see Besalú, but if you are anything like me when it comes about medieval history, then you could spend the whole day wandering around. 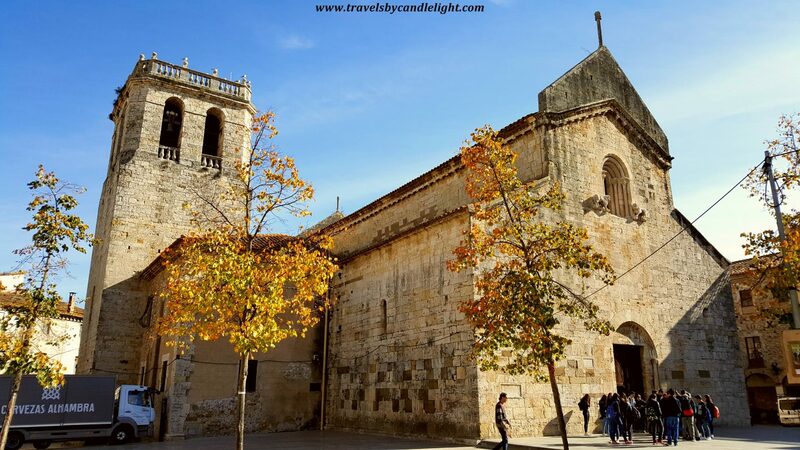 For such a small town (about 2400 inhabitants), there are quite a few churches in Besalú (in ruins or fully functional) starting with an 11th century Benedictine Church of Sant Pere in the middle of the town. Then you will find the Romanesque church of Santa Vicenç (dating from 1018) and the ruins of Romanesque Santa María, on a rise overlooking the village. 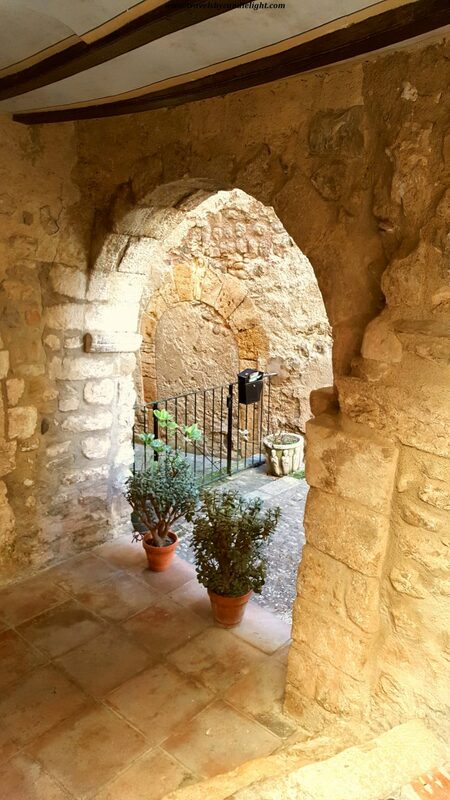 Also, there is the small chapel of Sant Jaume (from the 12th century) and, behind the monastery, the church of the hospital of Sant Julià, dating from c. XII, with an outstanding entrance portal. And if you get tired of all the stony walls and fancy some nature, you can easily step out of the town and take a walk along the river or even have a picnic. 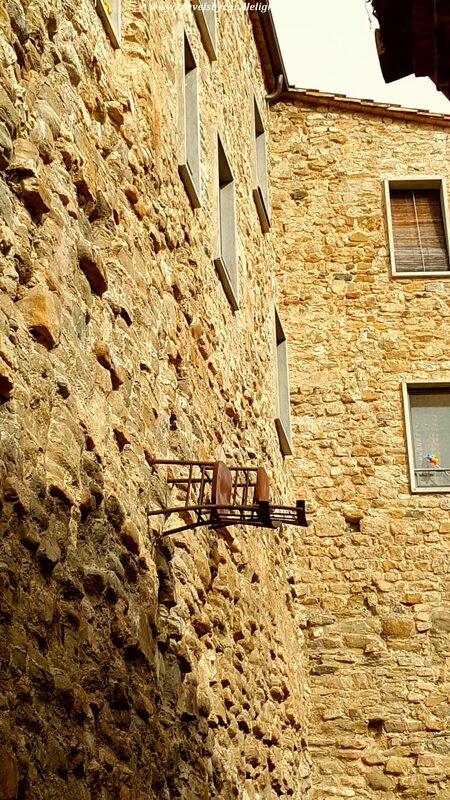 There is an interesting sculpture exhibited on the walls of one street, Carer Rocafort – what you see below is not a upside down photo, but a sculpture created as part of an artistic exchange between Girona Council and the Italian region of Frosinone, symbolizing the difficulties that humanity has to face in reaching its goals. 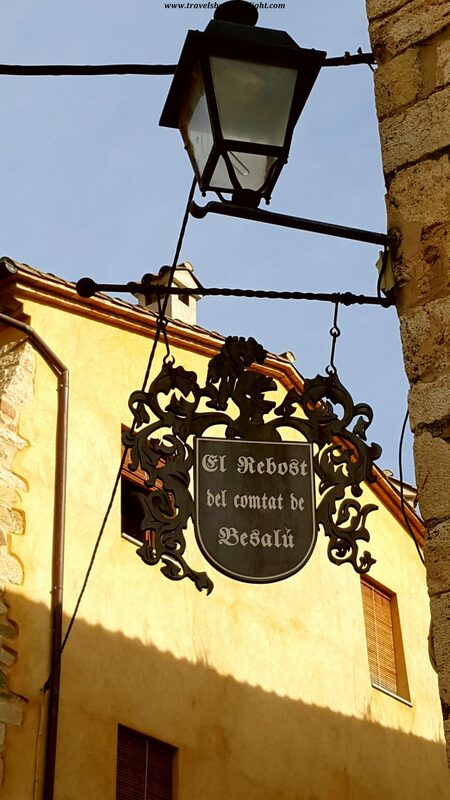 Placa Llibertat, in Besalú’s centre, is a beautiful medieval square surrounded by artisan shops, restaurants and cafes. I got to the square at the same time with a school bus full of (very) noisy teens, so I rushed away and spent some time watching the orchard, where people were cleaning the gardens and small fires were smouldering. This reminded me so much of my childhood autumns, when my grandmother was doing the same – gathering all the dry leaves and roots from the vegetables garden and setting them on fire, while my sister and I were trying to roast tiny bell peppers found forlornly amongst the remains of the garden. I will never forget that smoky smell! Back in the past, the town was part of the “Caminos de Sefarad”, which is the Jewish route in Spain and has preserved a unique Jewish heritage: a restored mikveh, a ritual Jewish bath dating from the 11th or 12th century, which was rediscovered by chance in the 1960s during some construction work and is one of only three still surviving in Europe. Also, located near the river, are the remains of a medieval synagogue. 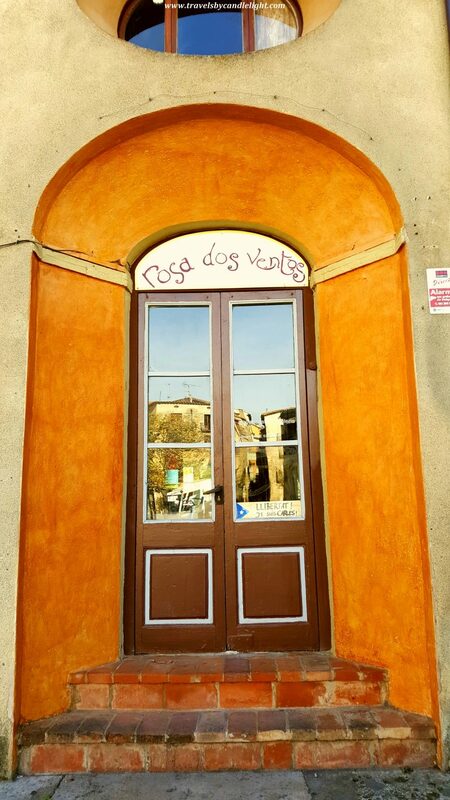 There is even a small quirky museum in Besalú – Museum of Miniatures – created by jeweler and art collector Lluís Carreras where you will find minuscule versions of shops and hair salons to works of art so small they have to be viewed through a microscope.